Race 2 MAC banbrekers - De website van onroad-electro! 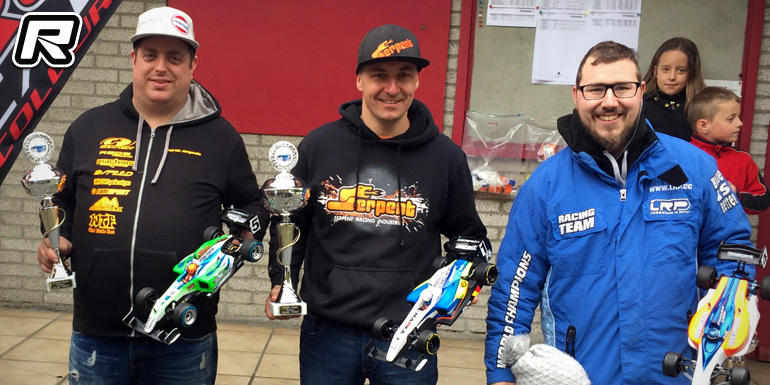 The second round of the Belgian FBA Electric On-road national championship was held at the fast and flowing track of the MAC de Baanbrekers in Rucphen. The race attracted 55 drivers, divided over the classes of Rookie, Formula, Touring Stock and Touring Modified. The weekend started off with free practice on Saturday and thanks to the warm weather the grip level was excellent whereas on Sunday the track was damp with ambient temperatures of only about 11 degree Celsius, meaning Saturday’s setup was pretty much obsolete. In the premier Touring Modified class Ollie Ollie Buyltinck (Awesomatix) was had his first outing at the nationals and everyone was keen to see if up and coming Mitchell Van Ess (Awesomatix) would be able to challenge the veteran racer. Olivier was then soon up to speed, taking the provisional pole despite having to run in a lower heat. His fastest single laptime came close to the track record while Mitchell set the fastest time in the top group, some 3 seconds behind Ollie. Nicolas Delisé completed the Awesomatix top 3, but he was followed closely as well by Athan De Witte’s VBC. 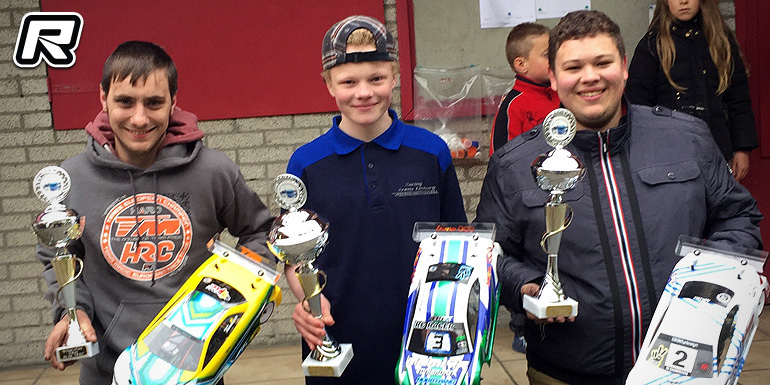 13-years old Liam Van de Wouwer completed the top 5 running a Yokomo. In Q2 it was again Olivier whi set the pace, but while Mitchell claimed P2, both Athan and Nicolas were victims of a DNF. The top 5 was completed by Rico Claeys (Xray), Liam and Robby Engelen (Xray). In Q3 it Mitchell who fell victim of the mechanical gremlins. Young Athan De Witte claimed P2 behind Olivier and succeeded Nicolas, Liam and Robby. With Olivier dominating the event in the qualifying, the main focus in the finals would be on the battle for the remaining podium spots. In A1 Ollie was cheered on by his daughter Anais, and this motivated him to set a new official 1/10th electric track record with a 14.102s. Mitchell took P2, but he was closely followed by Athan, Nicolas and Rico. A2 again went Olivier’s way, but the battle between Mitchell and Athan started to take shape. Athan was following in Mitchell’s wheelmarks and positioning himself for an attack. Unfortunately for Mitchell, his rear hub carrier came loose and he scored a DNF. Athan took a great P2 in front of Rico, Géry Ledocq (Kyosho) and Pascal Delferiere (VBC). Ollie decided to sit out A3 after having already taken the overall win and this let the fight for P2 wide open. Mitchell took a convincing lead and held it to the finish. Athan was putting a lot of pressure on Nicolas but the latter’s car suffered from a major understeer and he had to nurse his car around the track. When everyone expected Athan to make his move, he got his by a back marker and had to settle for P3. Nicolas later checked his car and found that his front stabiliser came loose, which caused the erratic behaviour of his car. Rico followed in 4th ahead of Liam who made a fine drive to 5th. 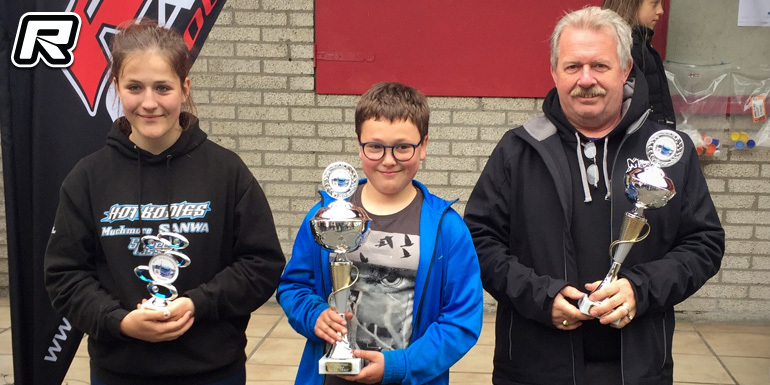 The overall top 5 positions were Olivier Buyltinck (Awesomatix), Mitchell Van Es (Awesomatix), Athan De Witte (VBC), Nicolas Delisé (Awesomatix) and Géry Ledocq (Kyosho). Touring Stock was the strongest class of the weekend with 24 drivers. Because of the fast and flowing nature of the track, the racing would prove to be very competitive and exciting in this class where the top speeds are virtually identical. Once again it became clear that racing and free practice are two different things. During the free practice in the warmer conditions, Florian Joos’s Tamiya was the car to beat. With a laptime of 17.34 he was clearly faster than the other drivers. Sunday however, in the colder conditions, Vincent Van Gansen (Xray) set the pace. The young driver lead the way but he was followed on a shoe-string by Florian Joos, Stefan Rommens (Team Magic), Peter Degrande’s VBC and Christophe Charlier (Awesomatix). Q2 was a disaster for Florian as his mechanic fried his car’s speed controller before the start. Vincent took a blistering start but rolled his car at the entry of the pit straight. This let Stefan Rommens in the lead, and Stefan tried to claim P1. Vincent however was having none of it and started to claw back to the top, but in the end Stefan took Q2. Q3 proved to be a thriller. Vincent took off in P1, and he was followed by Stefan and Christophe Charlier. Because of his DNF in Q2, Florian had to start in the last position. The four drivers exchanged the lead over and over again and in the end it was Florian who claimed P1 by 0.15 in front of Vincent, Stefan, Peter and Christophe. All drivers had the utmost respect for each other and this was clearly visible during the finals. There were some great passes but zero contact. It was a great showcase for our sports. In A1 Florian took the early lead and Vincent followed him closely. The latter had to fend off the attacks from Stefan and Peter however and this gave Florian the opportunity to open a gap. Stefan made a great move in the esses after the straight and took P2. Vincent however was keen to take his P2 back and made a great move when entering the straight to claim P2 in front of Stefan, Peter and Christophe. A2 was a thriller as Florian, Vincent, Stefan and Peter followed in each others slipstream for five minutes. They finished in the same order as they started, but the crowds really loved watching this final. As Florian already bagged the overall victory, he went for a more conventional setup, which made his car a bit easier to drive but slower as well. Florian and Vincent were able to break away from Stefan. When Florian took a different line entering the hairpin corner, Vincent was unsettled and ran too wide over the kerb. This let Stefan close the gap again and soon he was on Vincent’s rear bumper. Stefan took a slightly tighter line entering the main straight and was able to pass Vincent for P2. He soon started to put pressure on Florian and when Florian made an error Stefan took over the lead. Vincent followed in Stefan’s slipstream but Stefan kept his cool and claimed A3. This gave the final top 5 ranking of Florian Joos (Tamiya), Vincent Van Gansen (Xray), Stefan Rommens (Team Magic), Peter Degrande (VBC Racing) and Christophe Charlier (Awesomatix). The Formula class attracted 11 drivers. Despite the lower turnout, the quality of the drivers is quite high, as the grid was filled with three ETS A-main finalists – Olivier Buyltinck, Steve Deblaere and Nicolas Delisé. Local drivers Patrick Jongenelis and Marc Martens were however keen to exploit their track advantage to the fullest. Because both Steve and Olivier missed the first race, they had to start in the second heat. Steve Deblaere (Serpent) was however unaffected by this and set the pace in Q1. He was five seconds clear of Florian Joos (Shepherd) and the outsider Bjorn Frederickx. In A2, Steve went even faster and recorded a 16 lapper in 505, some five seconds faster than his first run. Florian Joos recorded almost the same time and found himself in P2, in front of Patrick Jongenelis (Serpent) and Olivier Buyltinck (Shepherd), who was struggling with the tyre prep in the colder weather. Steve took Q3 as well, and with a time of 16 in 503 he took P1 on the grid. He was followed by Florian Joos, an outstanding Bjorn Frederickx, Olivier Buyltinck and Patrick Jongenelis. The top 5 were covered by only five seconds, so the finals would prove to be interesting. The start of A1 was quite eventful as the drivers weren’t able to do a warm-up lap and had to line up on the grid immediately. The biggest victim was Florian, who went sideways in the first corner and was passed by the entire field. To aggravate the situation even further, he couldn’t defend his chances as his battery wasn’t fully charged. Meanwhile, Steve took the hole shot, but Olivier proved his skill and passed Bjorn for P2. He started challenging Steve, but Steve claimed A1 in front of Ollie, Patrick, Frans Engelen (Xray) and Florian. A2 was a bit more eventful as Olivier was whipped out at the start and had to attack from the back of the field. Steve was leading dominantly in front of Florian and Patrick. Patrick passed Florian for P2 and Olivier claimed P4 in front of Frans Engelen who drove a very solid A2 as well. A3 then saw yet another victory of Steve in front of Olivier, Patrick and Bjorn who finally had an event-free final. Frans claimed a strong P5 again. The final results were Steve Deblaere (Serpent), Olivier Buyltinck (Shepherd), Patrick Jongenelis (Serpent), Florian Joos (Shepherd) and Frans Engelen (Xray). 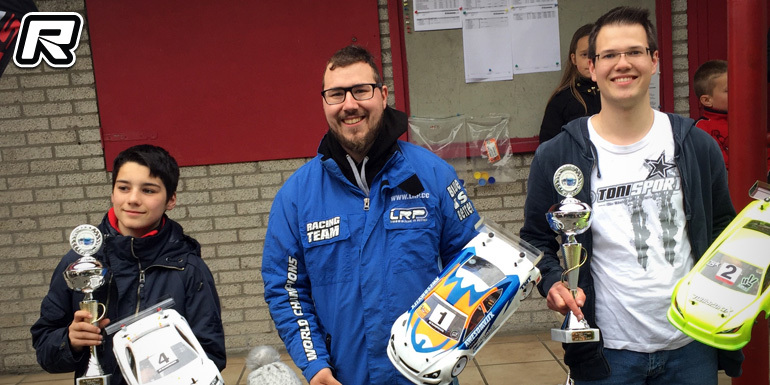 In the supporting Rookie class the six drivers finished in the following order: Alexandre Van Gansen (Junior), Rony Claeys, Marc Joosens, Herman Van Gansen, Lorenzo Vandepoele and Rebekka Masschelein.